Molly O’Kash essentially grew up in the Blue Moon Café, a restaurant-turned-bar in Superior’s notorious North End, along with three brothers and five sisters. The daughter of Yugoslovian immigrants she would follow in her father’s footsteps and is remembered as the proprietress of Molly’s Bar on Tower Avenue. Molly O’Kash was born on Valentine’s Day 1914, her parents, Nicholas and Pearl O’Kash, followed the steel-mill trail from Pennsylvania to Gary, Indiana, and then to New Duluth, where they lived for a time on a small farm outside the city limits, near Wrenshall, Minnesota. Around 1924, the family moved to Superior when Nick and Pearl purchased the Blue Moon Café, later a tavern, at 1716 North Third Street. Molly—along with brothers George, Michael, and Alex and sisters Millie, Mary, Diane, Dorothy, and Lorraine—was raised in Superior’s rough-and-tumble north end, crowded in with their parents in a shotgun apartment above the Blue Moon. It could be said the O’Kash family business took root during those years on the farm in Wrenshall, where Nick operated an illegal still and ran bootleg whiskey throughout Prohibition. According to family lore, Molly once crawled through a tunnel to secure a barrel of whiskey and was caught in a raid by federal agents. She escaped a jail sentence only by virtue of her age—she was just 16 years old. All of the children worked in their parents’ bar serving food, washing dishes, and—in the case of the boys—swamping out after hours. Hospitality, and especially the bar business, became the family stock and trade. At one point in the 1950s, within one square block O’Kash family members operated a boarding house, the Blue Moon, the infamous Anchor Bar, and a place called Molly’s. Molly and her first husband, Oscar Muench Sr., opened the original Molly’s Bar at 302 Tower Avenue in 1938 and relocated twice over the next 12 years, first to 1807 N. Third Street (1941-1942), then to 318 Tower Avenue (1943-1944), then to 514 Tower Avenue (1945-1952). In 1953, after Oscar’s death from a heart attack, Molly moved her bar to 405 Tower Avenue. She and her son Oscar Jr. lived in the apartment above the business, just as she had done as a child at the Blue Moon. For a brief period they were joined by Molly’s second husband, Andy Spaun, but the union was short-lived. Molly kept the Spaun name and used it in all business dealings and publicly for the most part, but to her family and in her heart she was Molly Muench. Molly’s Bar became an establishment of some renown, and Molly became a legend in her own time—known far and wide by virtue of the stories customers carried from her establishment to places beyond. Minnesota songwriter, musician, and author Paul Metsa wrote of her in his book Blue Guitar Highway. “[Molly] had seen it all. She would dispense Gypsy wisdom with a wise twinkle in her eye, and would let you buy her at least one shot of top-shelf brandy in return for the advice.” Metsa composed the song, “Christmas at Molly’s,” writing the lyrics on the back of a napkin while sitting at the bar one cold December night. Some of Molly’s folk wisdoms included keeping a raw potato in her bra and wearing copper bracelets, both to ease the ache in her arthritic bones. She often pitched pennies at the door to draw customers in when business was slow. Though she put stock in such superstitions, her advice to others was more often pragmatic. Anyone who worked behind Molly’s bar knew never to turn down a drink offered from a customer—it meant money in the till. And many a woman, young and old alike, was reminded to keep a man at a distance until there was a ring on her finger. Her son Oscar became her business partner in the 1970s and filled the bar with vintage advertisements, Tiffany lamps, and antique jukeboxes that somehow meshed with the original tin ceilings and the massive, Art Nouveau back-bar, hand-carved from solid oak and set with beveled mirrors. Oscar’s vintage Wurlitzer cast a neon glow into the bar’s otherwise dim, smoky-blue lighting. Stepping into Molly’s was like crossing the threshold to a previous era. For more than 53 years, as customers came and went, Molly’s Bar remained virtually unaltered, though the patrons did change over the decades. In the beginning, it was a working-man’s bar catering mostly to blue-collar laborers, longshoremen, and sailors on leave, all looking for a generous pour—and sometimes a home-cooked meal—for a fair price. And it wasn’t unusual to see “women of the evening” at Molly’s, but more often than not they were taking a load off their feet while chatting with Molly, not there to drum up business. In the late Sixties to early Seventies, the bar began to develop a unique mix of customers not often seen together. College students drank next to old-timers, prostitutes raised a glass with housewives and mothers, and civic leaders and business owners shared the bar with longshoremen. Then, near the end of its time, Molly’s gained a reputation as a gay bar, but only among those who never frequented the unique gathering place. It was true that Molly welcomed her son’s gay friends and the LGBT community, but overall Molly’s patronage remained a melting pot of young, old, straight, gay, rich, and poor—everybody got along at Molly’s. There was one notable exception in 2001, when two men got in a scuffle at closing time. A series of shots rang out, Oscar pulled his mother to the floor, and customers dove for cover. Both men were injured and Molly’s Bar was left with a few bullet holes in the floor and ceiling. Molly was unscathed. There are a few stories any regular at Molly’s could tell: In the early years, when she was a single mother working alone in a rough neighborhood, she kept two well-trained German Shepherds behind her bar for protection and companionship. One of those shepherds, Zeke, saved her and her son’s lives by alerting them to a fire in the middle of the night (the fire department responded quickly and there was little damage to the bar). Another beloved shepherd, Cynthia, passed away and was put to rest in a marked grave on the side lot of the bar, giving pause to non-regulars who didn’t know what—or who—was buried there. Loyal customers also knew the reason why, in her later years, Molly always wore slippers to work: her feet were so crippled with arthritis—from standing behind a bar 16-hour days, 365 days a year, nearly her entire life—that she couldn’t get them into shoes. And if you sat at Molly’s more than a handful of times you learned that she never turned away a person in need. She could always find some little job that needed doing in exchange for a bite to eat, clearing an overdue bar tab, or for cash pay. At Thanksgiving and Christmas, the pool table was often turned into a banquet table for the extended O’Kash family holiday, but any lucky customer in Molly’s on those days was welcomed to join in the traditional feast of leg of lamb, sarma (cabbage rolls), pogacha (a flat bread), potica (walnut-filled sweet bread), and of course turkey and ham for the less adventurous. 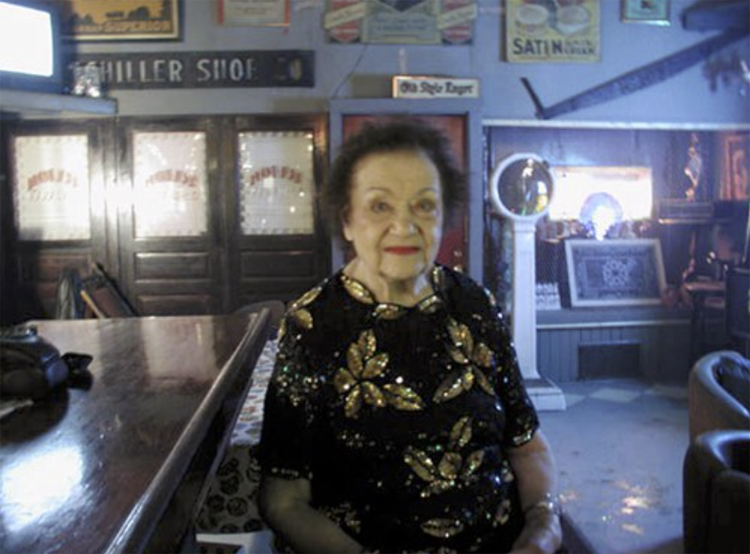 Through it all, for more than half a century, Molly presided like a queen holding court—in later years perched on a stool at the end of the bar while Oscar served the customers. Molly and Oscar sold the bar in 2005. New owners renamed it the Tower Avenue Tavern and for several more years Molly could still be found there every Friday, around 4 p.m., enjoying a beverage on the house and holding court from “her” stool. Molly passed away on April 3, 2013, less than two months after her ninety-ninth birthday celebration—a much-anticipated and well-attended annual event that continued beyond her retirement. Her son Oscar passed away from complications of diabetes the following month, ending a chapter of Superior’s North End history. Click here to meet Molly’s sister Dorothy Blaine, who took the O’Kash-family story to New York City to write her own chapter.